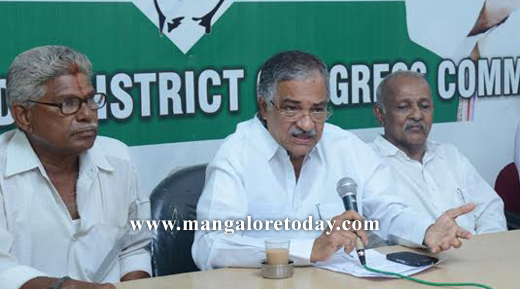 Mangaluru, June 9,2016 : Senior Congress leader and former MLA Vijay Kumar Shetty has lashed out at former president of Puttur Block Congress Kavu Hemanath Shetty for his verbal attack on senior party leader and former union minister B Janardhana Poojary. 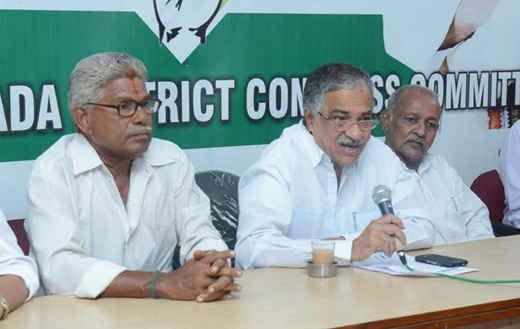 Speaking to reporters at the Congress Office on June 9, Thursday, Vijay Kumar said Kavu Hemanath Shetty had no right to criticise a leader of the calibre and stature of Poojary who was closely associated with the late prime minister Indira Gandhi, was a Union Minister, AICC member and also held different positions. Vijay Kumar described Poojary as a mass leader and said Kavu Hemanath Shetty had contributed less to the party but was more involved in anti-party activities. He also accused Hemanath of working against his own party men like the late Bondala Jagannath Shetty, Shakuntala Shetty, Sankappa Rai and others. He also questioned if Kavu Hemanath Shetty has forgotten that it was Poojary who helped him become the Puttur Congress President and also his wife a ZP member. By criticising Poojary, Hemanath Shetty has offended the party, he said. On Hemanath’s statements that he would wave black flags against Poojary in Puttur, Vijay Kumar said it would be better for him to do this against DV Sadananda Gowda and Veerappa Moily who were instrumental in implementation of Yettinahole Project. "It was Veerappa Moily who is speaking through Shetty," Vijay Kumar alleged and said he has also gathered that a delegation including Mayor Harinath, MUDA Chairman Ibrahim Kodijal and MLC Ivan D’Souza have gone to Bengaluru to complain against Poojary with the chief minister. Purushottam Chitrapur, former deputy mayor, corporators Deepak Poojary, Lancelot Pinto, Appi and others were present. The press meets for such simple talks has been common talks People are used to such and enjoy.